I apologize for being so absent lately and not posting any new recipes, but I’ve been enjoying my crazy life!! I’ve been on Nana duty for a week, getting to spend lots of time with two of my grand babies. Just me and a 5 & 3 year old. Yep, I can still get littles to school on time, help with homework, bath, and bedtime. My husband and I did a quick overnight to visit with our youngest daughter. My daughter and I spent a fun day together getting pedis and doing a little shopping (while my husband worked), then we met up with her boyfriend for a great dinner with his parents. Yeah, we finally met his parents!! We think he’s a keeper! We flew home on a Friday morning and that evening our oldest and her family arrived to spend a long weekend in SC. On Sat, we picked up our middle daughter and her two girls (ages 2 & 4) from the airport. They live the furthest away, so all chores cease when they’re home and it’s play time! Sunday was spent decorating and cooking. 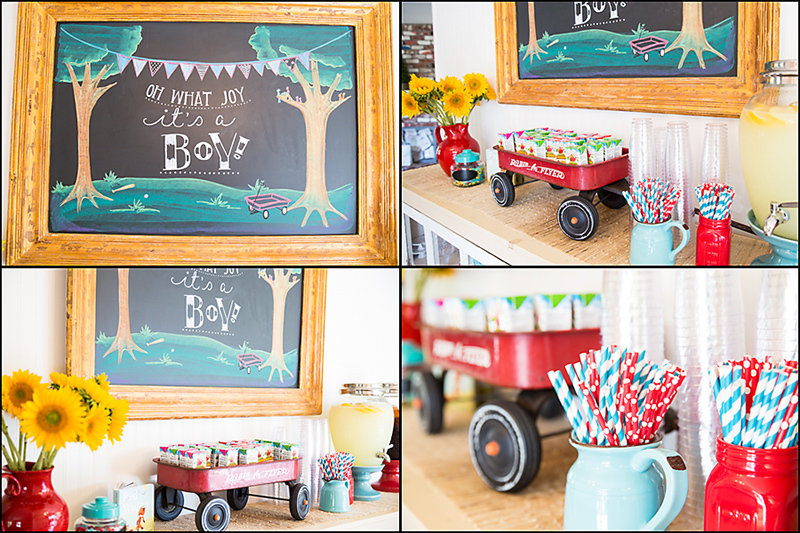 We hosted a baby shower/family bbq (for 50+) for our middle daughter who’s expecting baby boy mid July. That’s my life! It’s crazy, it’s busy, and I wouldn’t have it any other way!!! Sadly, I was so involved enjoying the party, that after the detail pictures, I set my camera down and never picked it back up. I’m kicking myself now, but in the moment I loved my time spent enjoying our family and guests. Not only did I not get any people pictures, but I took no pictures of the food. And it was good!! My straws and cupcake liners are always from Sweets & Treats! Always. I ordered my cake from Robin’s Cake Creations. 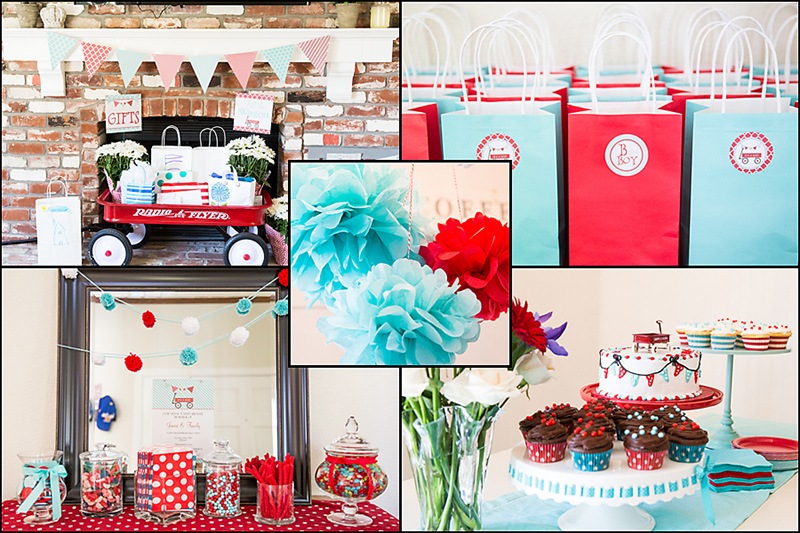 Adorable invite, signs, stickers, etc, from Beckie @ PartySoPerfect. Is this the most amazing chalkboard art you’ve ever seen? Talented doesn’t even begin to describe my friend Alyssa. I’ve known her since she was in kindergarten with my youngest daughter. Today she is the owner of Seven Directions Art Studio. All I told her was that the shower theme was “little red wagon” and not to make it too cutesy. Within minutes she was free handing this adorable and perfect chalkboard for me. Thank you, thank you, thank you, from the bottom of my heart. I love you Alyssa (and can’t wait to host a shower for you someday)! Let’s talk a little about what I didn’t show you. The food. I kept the appetizers simple: grilled sausages w/sweet & spicy mustard, hummus w/fresh veggies & pita chips, and a homemade bean dip (similar to Cowboy Caviar) served w/tortilla chips. Beverages included: homemade sweet tea, lemonade, waters (reg & bubbly), soda, beer, and wine. And because we had 20+ kids (7 & under), I also had applesauce pouches and some box lemonade drinks. Dessert: since I was doing all the main food and knew I was going to be out of town prior to the party, I kept it easy and ordered my cake from Robin. Simple and delicious! 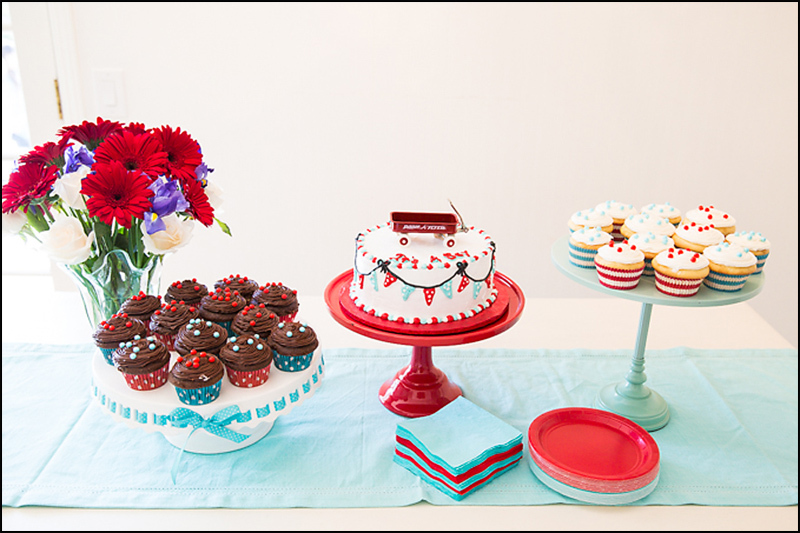 Even with being gone prior to this party, if you’re organized it can still be quite simple! Grocery Shopping: I did all my big shopping at the beginning of the week (hello Costco). I was able to get all the drinks, chicken, and marinated tri-tips in advance. I did the final grocery store shopping on Friday morning (before all my family started arriving home). Flowers were purchased while out shopping on Friday morning. 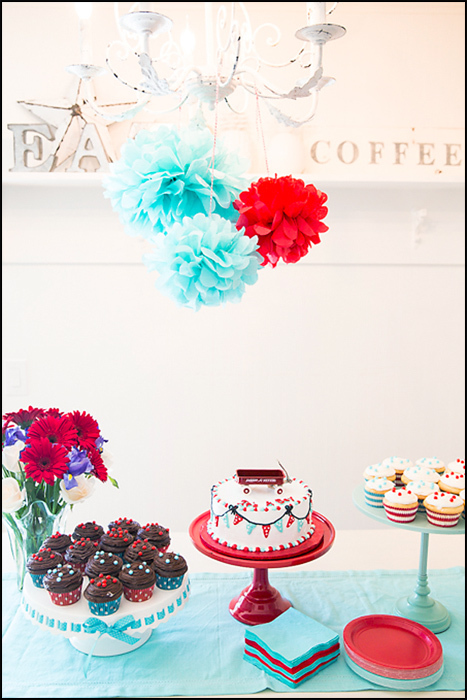 Decorating: I did some of it before I left town, including setting up the candy table. I had all the paper products opened and stacked on my dining hutch. I even had my drink dispensers out and just waiting to be filled. I knew the little ones wanted to help decorate so I saved filling party bags, hanging banner, pom-pons, etc. for Saturday (the day before the party). Food: I prepped a bit on Friday and Saturday, including, making candied pecans (for the mango salad), washing & cutting broccoli, making salad dressing, and making garlic bread. When I use my large drink dispensers, I always make up ice cubes so that the ice does not dilute the beverage. I made up a couple batches of tea cubes for the iced tea. For the lemonade, I sliced a few lemons and froze them and also made a couple batches of lemonade cubes. The drinks remained icy cold and non-diluted all day! Saturdays prep was fairly simple. My son in law did all the BBQ’ing, and my oldest daughter and I finished all the salads and made the mac & cheese. Easy breasy! And, I could not, would not, be able to do any of my hosting of events or parties without the help of my husband. Seriously, he is the hardest worker I know and so patient of me as I direct him to “move this” or “make another run to the store.” And he doesn’t stop until everything is put away and the kitchen floor is swept! He’s a good one! 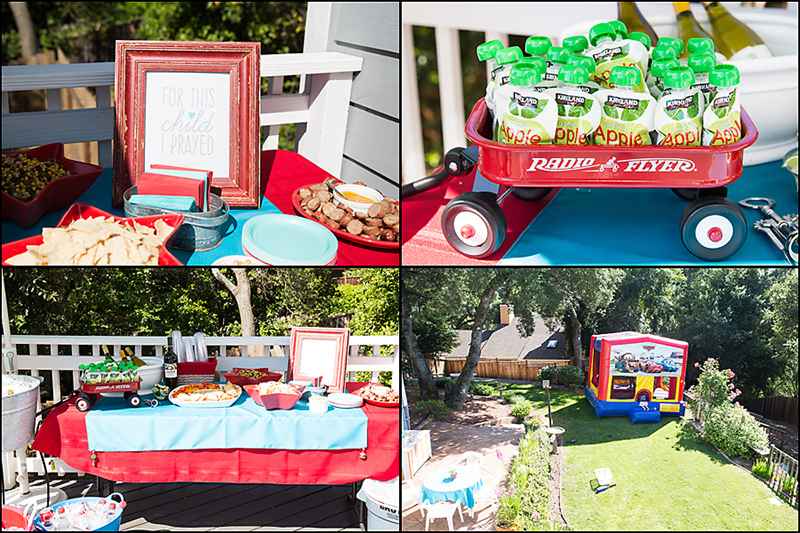 Love your posts, this party looked perfect… will copy the menu sometime! The menu looks terrific! And I love the dessert buffet and all your special touches!